Adding a new spin to the production, the ensemble acts like a Greek Chorus providing support to the story through the use of movement, speech, and music. Victoria, B.C.— Wintertime is coming, and for the students in Company C, that doesn’t just mean the season. 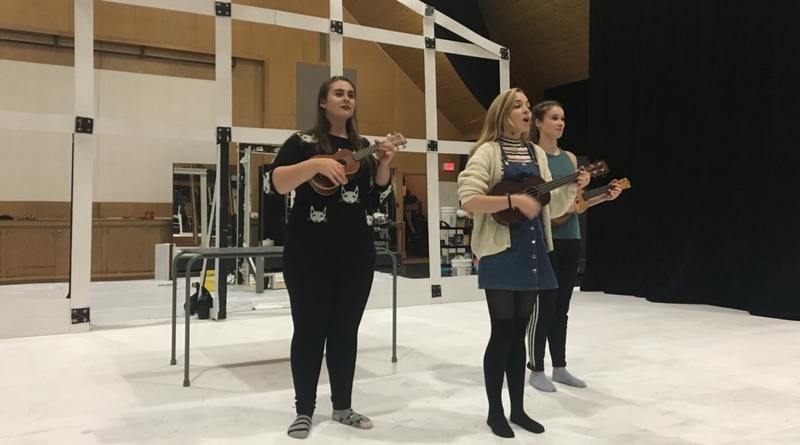 No need for long johns when things are heating up at the Canadian College of Performing Arts, this group of students completing their third-year program are tackling Charles L. Mee’s Wintertime at the CCPA Performance Hall (1701 Elgin Road) from November 29 to December 2. Directed by Sara-Jeanne Hosie, this cozy comedy features a collection of lovestruck characters that wear their hearts on their sleeves. Described as a “sweet, dreamy romantic comedy,” Wintertime tells the story of two young lovers, Jonathan and Ariel, who plan a private getaway at Jonathan’s cabin. Upon arrival they find that his parents, Maria and Frank had the same idea, to spend a weekend at the cabin with their respective lovers, Francois and Edmund. Throw in two lesbians from next door, a delivery person named Bob, and a flirty French doctor without walls and you have the makings of a physical theatre farce that promises laughs. Adding a new spin to the production, director Sara-Jeanne Hosie has found a way to incorporate some new characters into the show, the ensemble. Hosie explains that they will be acting as a sort of Greek Chorus. The women of the ensemble will provide support to the story through the use of movement, speech, and original music composed by Sara-Jeanne. “It’s going to be a challenging and inventive process for me and the students as Mee’s work encourages thinking outside the box, broad interpretation, abstract design, physical theatre, and dance.” Hosie inspires her cast to be a part of the creative process, and have no preconceived notions about the characters; their journey is left for the actors to discover, guided carefully by Sara-Jeanne’s vision for the play. Meanwhile, the rest of the cast is hard at work creating an immersive experience for the audience by crafting the winter wonderland that Charles Mee imagined. The students in Company C not only take on roles onstage but also work behind the scenes in various areas of production such as lights, sound, marketing, sets, props and so much more. The magic happens on and offstage with these talented, emerging artists, and they can’t wait to bare it all with their presentation of Wintertime. Wintertime will be shared in CCPA’s in-house Performance Hall, 1701 Elgin Road, Oak Bay, on November 29th, and 30th at 7:30 pm, and December 1st and 2nd at 2:00 pm and 7:30 pm. Tickets can be purchased online at ccpacanada.eventbrite.com, or by calling 250-595-9970. Reserve your seat for an evening (or afternoon) of love, laughs, and lingerie. Company C is a six-month program offered only to graduates of the two-year performing arts diploma at the Canadian College of Performing Arts, giving young performers the chance to work on three professional shows, in a professional environment, with professional directors engaged in the industry. The company completed their first show The Old Curiosity Shop under the direction of Sarah Rodgers, and the season ahead still includes the famed musical Cabaret directed by Ron Jenkins. We would like to offer up the opportunity to conduct interviews, either on the phone or here at the college. We would also like offer a chance to film or photograph the show on the week of November 22-25. This would be an excellent opportunity to speak to the students in Company C as cast and crew members. Our director Sara-Jeanne Hosie would also love to be involved in the interview process.